Clubs and bars in Santa Marta have improved a lot over the past five years or so. Many of the old seedy bars have gone and a varied nightlife scene has emerged. A couple of recommended venues follow. Crabs, whose original home was Bogota, has re-settled in Santa Marta (Calle 18 No. 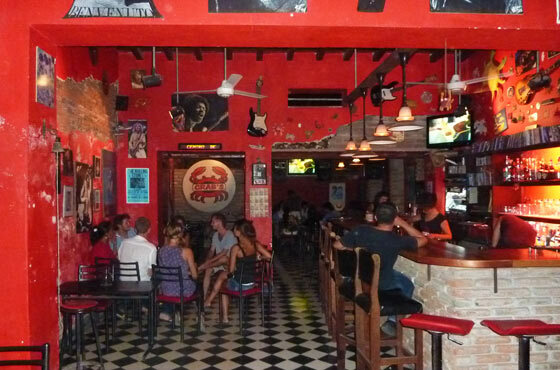 3-69) and is far and away Santa Marta's best rock bar. They tend to play classic rock and blues rather than the more modern stuff. The walls are decorated with guitars, rock photos and, of course, crabs! This is a really good place to start the night - a few cool relaxing beers before heading on to somewhere a little livelier. For cocktails and chillout music, head to Roots and Sounds (Calle 19 No. 2a-29). The place has a great range of cocktails and the reggae and electronic music definitely give off a Caribbean vibe. 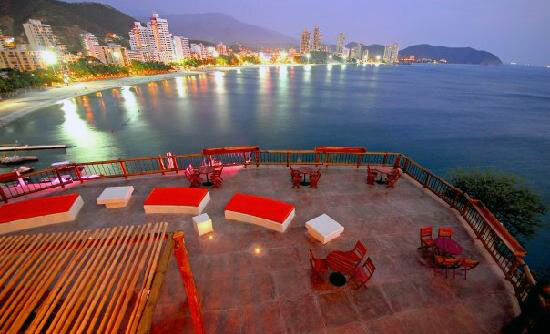 One of the best bars in Santa Marta for a romantic night out. One place worth checking out in Taganga is El Garaje (The Garage). This is an outside bar that is popular on a Wednesday night when Santa Marta is fairly quiet. The place attracts backpackers staying in Taganga, but plenty of locals head there too. It is a good option beacuse you can either sit and chat on the edges of the large patio without music crushing your ears, or have a dance in the middle. El Garaje doesn't really get going until around midnight. Burukuka is a fabulous bar, club and restaurant rolled into one. It is located high up on the headland separating Santa Marta from El Rodadero. Most people initially come here for a meal, but by 10pm the drinks begin to really flow and the dancefloor becomes packed. And best of all are the amazing views of El Rodadero and out to the Caribbean Sea. The place isn't cheap, but if your budget will stretch, it's well worth it! 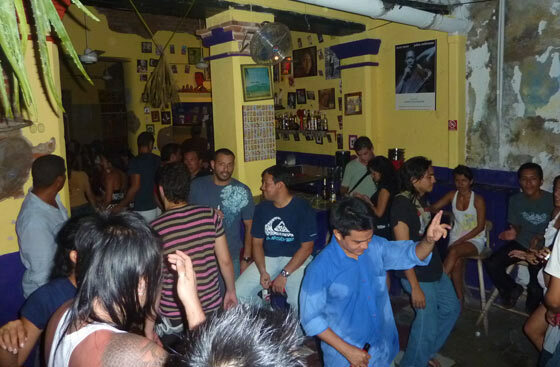 La Puerta is a nightclub that is popular with both Colombians and foreigners that want to party hard until late. There is a nice little courtyard area at the back of the bar where you can take a break from the dancing. The music is a mix of rock and latin music. The place attracts a young crowd and is probably the best option for those looking to get 'on the pull'. Friends of mine from Santa Marta jokingly refer to La Puerta as 'La Puerca' (meaning something along the lines of 'The Dirty Place') due to its rough and slightly sleazy feel! The most exclusive club in the Santa Marta area is without doubt La Escollera. This huge club is situated on an island in a lake and can hold about 1500 people. It has a large dancefloor and attracts some good DJs. It doesn't come cheap, but is a great place to dance til you drop! On weekends it stays open til 4am.